New York, NY (October 19, 2017) – Over the weekend, Classic Harbor Line (CHL) kicked off their fall foliage programming with popular Fall Foliage Brunch Cruises on classically designed 1920s style commuter yachts Manhattan and Manhattan II, and Fall Foliage Sailing Excursions on Schooner Adirondack and sister ship, Schooner Adirondack III. Select NYC Fall Foliage tours will be offered through November 12 this year. CHL is located at Pier 62 of the Chelsea Piers Complex where all tours depart. 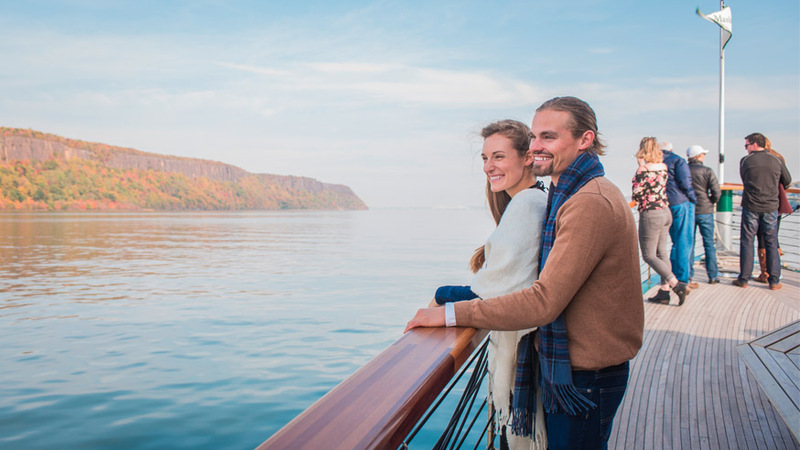 Guests can expect a trip up the Hudson River to the cliffs of the Palisades, where the crisp autumn air blends peacefully with a vibrant landscape. Occasionally the motor yachts will cruise up to the Tappan Zee Bridge. During the tour, guests are encouraged to snuggle up with a blanket and relax with a hot beverage in hand. Select cruises include brunch or lunch, and every cruise includes a complimentary beer, wine, Champagne, or soda from the bar. Guests on the Fall Foliage sailing tours on Schooner Adirondack and Adirondack III will enjoy a 4- hour leisurely sail up the Hudson River. Tickets are all-inclusive and include three rounds of beer, wine, or Champagne, hot beverages and lunch. CHL has three 1920s-inspired commuter yachts that are timelessly elegant, featuring teak decks and mahogany trim. Guests are able to settle into the glassed-in, climate-controlled cabin of Yacht Manhattan or Manhattan II and take in the picturesque trees nestled along Manhattan’s unparalleled waterfront and skyline. Think Leonardo DiCaprio and The Great Gatsby era. The Fall Foliage Brunch Cruise includes a 4-course buffet, and a complimentary mimosa or Bloody Mary from the bar. Pastries, New York style bagels and lox, and pumpkin-spiced waffles are served fresh off the iron, followed by two main courses of breakfast sausage, quiche, and an oven roasted ham to mention a few items. Afternoon cruises up the Hudson River are also offered on classic Yacht Kingston. These 2.75-hour cruises are available on select weekdays and weekends throughout the season. Guests are encouraged to bring their own picnic and enjoy the sights! CHL is the only boat tour company in New York to offer an architecture boat cruise. The AIANY Around Manhattan Architecture Cruise is a great experience for New Yorkers and visitors alike that are interested in learning more about the buildings, new and old, that shape our famous skyline. In collaboration with the American Institute of Architects New York Chapter, this unique, five-star tour is not to be missed. The vantage points from the boat in combination with comfortable seating, iconic city views, a complimentary beverage, and a comprehensive narration of Manhattan’s most outstanding structures is spectacular. The added value to this cruise in the fall is the foliage in the northern parts of Manhattan and all along the waterfront. The month of October, also known as Archtober, is New York City’s architecture and design month. 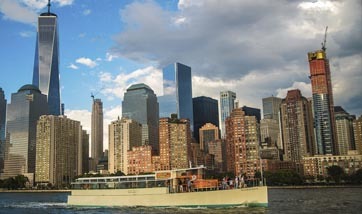 Throughout the month, CHL ramps up their architecture cruises offering additional departure times for the Around Manhattan Architecture Cruise, as well as the Around Manhattan Historic Architecture Cruise, Bridges and Infrastructure Cruise, and Lower Manhattan Architecture Cruise. 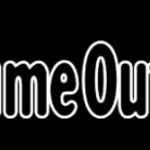 Visit www.sail-nyc.com for more information.